Key Term: Personal care is an occupation. A bathroom focused week as an OT student; involving bath lifts, perching stools, level access showers and access to toilet-ing. 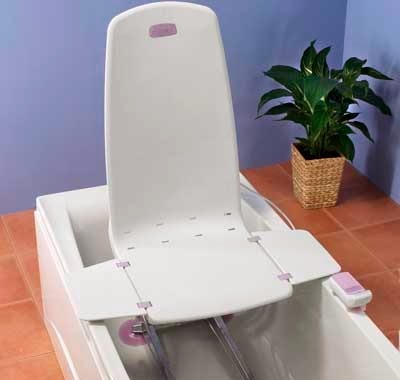 My week began with getting to try out a bath lift to check it was stable whilst it was fitted in a clients house by one of the other OTs. It was a helpful experience for me as a student as I begin to understand more of the equipment that is available to support people to access their facilities for personal care at home. As an OTA in a acute setting, it was something that I didn't get direct experience of (to see how it worked) as people were able to be discharged home if they could access the sink for a basin wash. I have been grappling with this point a lot for a while now, and I know why that is seen as a reasonable option for discharge from hospital (with pressure for beds and the importance of people recovering in their own home) but I almost could put it to the back of my mind as I'd feel that bathing access would be assessed in the community when they are at home. But what does this mean for a younger generation (I know this is a slight assumption) of people, where being able to access the shower is seen as essential to them? I don't know how not being able to shower would effect me psychologically as a well, able bodied person; never mind if I was suffering from a long term condition or illness. Even working in the hospital I found it hard to inform younger people that they were expected to just have a basin wash if they couldn't access their bath or over bath shower, or that the equipment that we would provide such as a bath board would mean them accessing it in a way that seemed so alien to them. As an OT student, the discussions I have observed and been involved in are helping me to find ways to communicate this to clients in a more natural way and are also enabling me to understand the the importance of organisational/social services entitlement and guidance to give the client the relevant information on why they are having to make the change and why its not so simple as having a wet room put into their house. This week involved me navigating a strange city and its bus routes to visit a client on my own (I had pervasively visited the client with my educator). I'm pleased it was a successful visit and gave me a chance to build my confidence in managing the expectations of clients on my own. This weeks blog was very 'spill my thoughts onto the page', because I'm tired and my dyslexic brain is winning! Hopefully next weeks will be back on normal form.